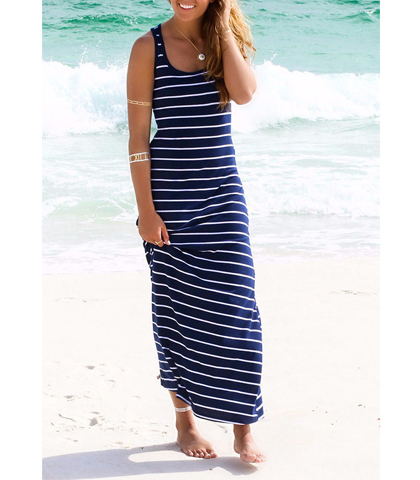 Length N/A 52.5" 53" 53.5" 54"
Fun stripes are featured on this fabulous beach dress which can be worn to the beach or to any casual outdoor event. Toss on a pair of low sandals or flip flops and wade in the water as you wear this soft, easy flowing dress with a calf length hemline and plenty of style. Wide armholes show off your shoulders and the gently rounded neckline dips down to your bosom. A snug, body hugging style shows off your curves, allowing you to move naturally without restrictions from the loose hemline. Small size; bust 80 cm, waist 72 cm, hip 102 cm, length 134 cm.